Highlighted in yellow on the map is what I call the "Takahara Ditch". It may go through parts of Awase too. 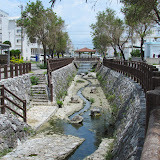 Leave it to the Okinawans to make something as simple as a ditch into something interesting. There is really nothing special about the place unless you like odd things and a place to walk your kids or walk your dog, or both. It's an option for a route and to see. I like to also think of it as a good meet up place to chat with some friends or if you just need some time to yourself. I wouldn't recommend driving all the way from Naha to see this, but if you are a local then maybe it is something to consider. OR...if you are a birder, then it might be a place to check out too. There is another point where the ditch takes you to an estuary where there is an Bird Observation Point at the Hiyagon Swamp. You can enter some places at the bottom of the ditch (see picture album to the right). Okinawan kids do different things sometimes; walking through the water, catching the little fish that live there, etc. I wouldn't recommend walking in there barefoot. There is some bird life every now and then at the ditch. I have spotted the Cinnamon Bittern and the Black Crowned Night Heron. They hunt for the little fish that swim there. I am gonna Map these too, cause there may be a few birders here on island that would like to know. I personally like to relax in the shade at one of those Cabana-like structures. There are certain areas you can just chill. Remember. Pack In, Pack Out. Landmarks - If you scroll north or north east on the map you will see a Family Mart or the Toys R Us building as a land mar to guide you in. Parking? It shouldn't be hard. I see cars parked next to the ditch all the time. Park at your own risk.